About a month ago I went to my first ever real live auction hoping to bag some bargains. I remember going to viewings at the local auction room as a child but I don’t recall us ever being there when the auction took place, I think my parents left their bid with the auctioneer. I don’t even know if we ever won the items in question. This time I’d looked at the catalogue on line and my friend Lynne (@josordoni) had been to the viewing and checked the items over for me along with the lots she was interested in. I set my maximum prices and off we went the next day. We took a quick look around, registered me as a bidder (getting my own personal number, excitement) and then as there was a wait for our first lots we went and had a coffee and a natter. Back at the auction I was fascinated by the whole process especially the very low key bidding on some rather nice pieces of furniture. Then I got the jitters worrying I would not stick to my prices once bidding got going. So I handed over to Lynne. I got all three lots. For a song. 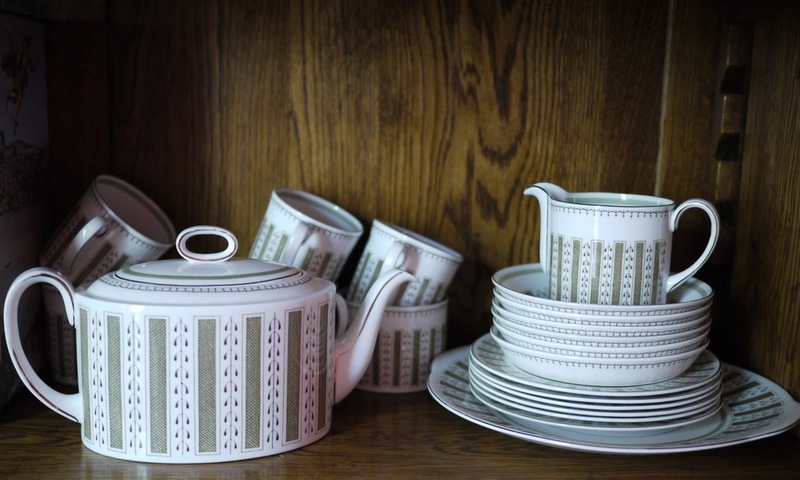 Heres my Susie Cooper tea service. And the bargains to be had made me wonder why anyone shops at IKEA…..
and I shall introduce you gently to the adrenaline of bidding yourself next time! !